I am sweating and my heart is racing. Twinges of panic appear but are then suppressed by thoughts: “How are we going to stop this bleeding?” “Where is it coming from?” “What happens if we can’t- I know the answer to that.” More twinges of panic. “Lord…help…” Blood fills the wound through a large crack in his skull. There are three of us working together: 2 residents and myself. I am supposed to be the experienced surgeon guiding the inexperienced through an operation that I have become confident doing through years of trial-by-fire. But I am not trained in neurosurgery and the brain seems a long way from the gallbladder right now. Bleeding continues. More sweating. We work together. One of us suctions, another elevates a fragment of bone away from the boy’s brain, and the other is ready with some packing to fill the hole to arrest the bleeding…. With the packing, the bleeding has stopped for the moment. We gently lift additional bone fragments out of the wound and then wash out the dirt. There is a tear in his dura- the lining around the brain which contains the clear fluid that bathes the brain and spinal cord. With fine suture we carefully sew this up. I breathe a sigh of relief as it appears the bleeding has mostly stopped. A few fragments of bone are replaced like a jig-saw puzzle to fill the bony defect and then we closed his soft tissue and skin. On rounds the next morning, the young boy is awake. He has already pulled his breathing tube out himself and he looks at me with an expression that says: “Dude, what was up with that breathing tube? And why do I have a killer headache?” He makes a great recovery and goes home a couple of days later. Have I simply failed to see God’s hand working in the past? Or is it only when I am stretched beyond my limits that I am able to see him working? Or is it that his strength is made perfect it my weakness? Likely all of the above. I am so touched by your humility. It is amazing how much God has grown in my mind since arriving here. He is bigger and I am shrinking. It is all good. God is good. So thankful you are doing his work in an area that so desperately needs you and your family. Amazing story! God Bless you and the work that you do! This touched me even more after just being there and watching you guys in action! There’s no question in my mind you’re where He wants you and the prayers continue! Great writing Heath. Thanks for being here. 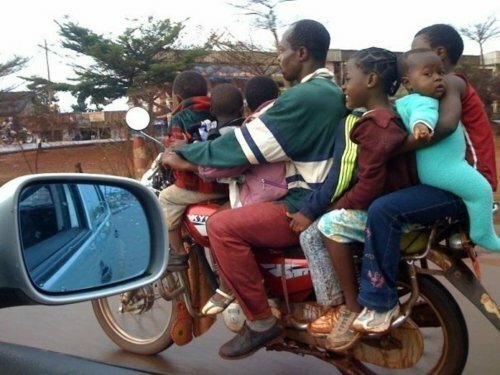 That pic of the piki has got to be the record for the most people on one bike. Praising God that He arranged for you to be there to care for this young lad! God continue to use you mightily…continue on following His lead…His blessings upon you!!! God bless you for your service!!! May He continue to use you mightily!!! Dr. Many: I appreciate what you said about wanting to flee back to a place where you “had most things figured out.” It is in those places that God is pushed aside. We don’t need faith when we can see. My mother used to quote a poem that ended this way: “Put your hand in the hand of God. It is better than a light and safer than a known way.” I am so moved and encouraged by your story. Thank you for sharing and I will remember to pray for you, your family, and your patients.